Meadowbrook Healthcare, in Plattsburgh, New York, is now offering a full continuum of skilled nursing care including: Subacute Rehabilitation, Limited Assistance, Restorative Therapy and Skilled Nursing Services. We are known as the North Country’s “Facility of Choice”. Through our well trained and educated staff we live up to that reputation every day. We take pride in employing the best and most qualified personnel in our industry. More than 70 of our employees have been with us for more than 10 years. Additionally, over 35 employees have been with us for more than 5 years. 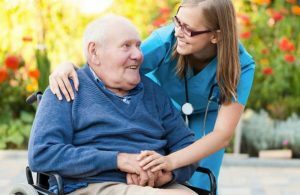 We believe that treating our residents and patients with the utmost dignity and respect is the single most important component of a person’s stay at our facility. Therefore every staff member, upon hire, is trained on this commitment. Since 1974, thousands of families have entrusted Meadowbrook Healthcare with providing care for their loved ones. Our entire staff takes the responsibility of earning and keeping your trust very seriously. Throughout our region, we are known as the “Facility of Choice” for both the care we extend to our residents as well as the engaging atmosphere our employees foster each and every day.